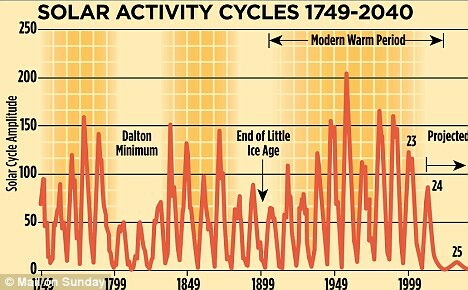 Meanwhile, leading climate scientists yesterday told The Mail on Sunday that, after emitting unusually high levels of energy throughout the 20th Century, the sun is now heading towards a ‘grand minimum’ in its output, threatening cold summers, bitter winters and a shortening of the season available for growing food. These findings are fiercely disputed by other solar experts. He pointed out that, in claiming the effect of the solar minimum would be small, the Met Office was relying on the same computer models that are being undermined by the current pause in global-warming. CO2 levels have continued to rise without interruption and, in 2007, the Met Office claimed that global warming was about to ‘come roaring back’. It said that between 2004 and 2014 there would be an overall increase of 0.3C. In 2009, it predicted that at least three of the years 2009 to 2014 would break the previous temperature record set in 1998. So far there is no sign of any of this happening. But yesterday a Met Office spokesman insisted its models were still valid. ‘The ten-year projection remains groundbreaking science. The period for the original projection is not over yet,’ he said. Dr Nicola Scafetta, of Duke University in North Carolina, is the author of several papers that argue the Met Office climate models show there should have been ‘steady warming from 2000 until now’. ‘If temperatures continue to stay flat or start to cool again, the divergence between the models and recorded data will eventually become so great that the whole scientific community will question the current theories,’ he said. He believes that as the Met Office model attaches much greater significance to CO2 than to the sun, it was bound to conclude that there would not be cooling. ‘The real issue is whether the model itself is accurate,’ Dr Scafetta said. Meanwhile, one of America’s most eminent climate experts, Professor Judith Curry of the Georgia Institute of Technology, said she found the Met Office’s confident prediction of a ‘negligible’ impact difficult to understand. ‘The responsible thing to do would be to accept the fact that the models may have severe shortcomings when it comes to the influence of the sun,’ said Professor Curry. As for the warming pause, she said that many scientists ‘are not surprised’. She argued it is becoming evident that factors other than CO2 play an important role in rising or falling warmth, such as the 60-year water temperature cycles in the Pacific and Atlantic oceans. ‘They have insufficiently been appreciated in terms of global climate,’ said Prof Curry. When both oceans were cold in the past, such as from 1940 to 1970, the climate cooled. The Pacific cycle ‘flipped’ back from warm to cold mode in 2008 and the Atlantic is also thought likely to flip in the next few years . Pal Brekke, senior adviser at the Norwegian Space Centre, said some scientists found the importance of water cycles difficult to accept, because doing so means admitting that the oceans – not CO2 – caused much of the global warming between 1970 and 1997. The same goes for the impact of the sun – which was highly active for much of the 20th Century. Meanwhile, since the end of last year, world temperatures have fallen by more than half a degree, as the cold ‘La Nina’ effect has re-emerged in the South Pacific.